We would love to host your special day whether it be a birthday party (ages 8+), a mom's night out, a bachelorette party or a team building night for work. You bring the supplies for your crew and we will get you to fly. Note: A deposit of $100/hr is required of all group lessons or parties. Plan ahead to reserve your space. Contact us via the form below or e-mail info@aerialworkscastlerock.com to check on availability. This is a great package for a Team-Building Group or Ladies' Night Out. We provide a beginning aerial lesson that allows you to get flying, inverting, swinging and partner work that is fun and engaging. This is similar to the 1 Hour Group Event, but allows for a little extra time to have fun! You can also squeeze in a few more people for a larger group. This is the perfect package for a Birthday Party or other special event to celebrate! 10 minutes meet & greet with guests, 1 hour aerial dance class and 50 minute use of the audience area of our space for cake & presents. Up to 10 kids (including birthday person). AerialWorks party favors for each guest and AerialWorks T-shirt presented to Birthday Star. Group Picture at the end of conclusion of your lesson. $25/person after first 10 people. Please note that our party packages do not include any party decorations, food, drinks, plates, etc. You are welcome to bring outside food, cake, etc. We provide a table to set-up your party. varies by time of year, and amount of time rented. contact us for a custom quote. 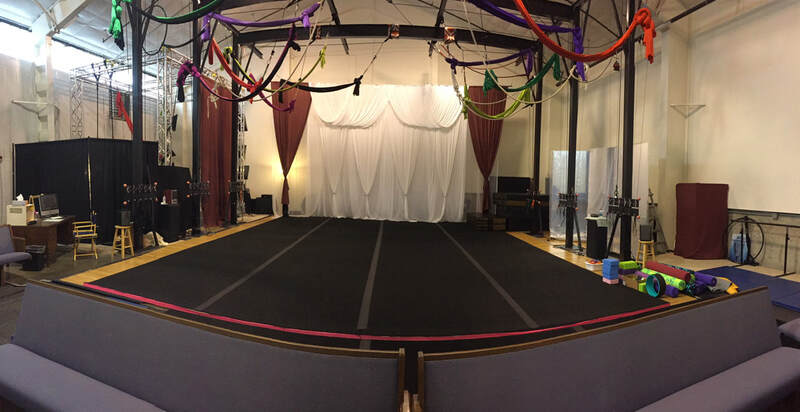 Are you a professional aerialist looking for a place to train, put together a performance, host a retreat, etc? You've found the perfect studio to rent! We have a well-stocked, easy-to-operate, world-class aerial studio. Our inventory includes trapezes, ropes, silks (non-stretch, medium stretch and stretchy), slings, hoops, harnesses and a photography studio all available for your use. We have tons of props including foam rollers, self-massage peanuts, resistance bands, training weights, grip-resistance training equipment, yoga mats and more. Our rig points are 17-19 feet tall, are adjustable and can easily fit up to 9 points active at one time, depending on the activity. We typically rent out our studio completely in June & July each summer. Our studio is also available year-round for weekly or hourly rentals. We are really excited to have others put it to quality use. You must carry aerial insurance and be a professional aerialist to rent our space. If you fit this description, please contact us today for a quote! E-mail info@aerialworkscastlerock.com. Housing is available for those who need it. Click here for more information on housing.